The quick and easy way to use Chinese taxi apps, for rush hour, rainy days, and Uber surge charge storms. Getting a taxi in Shanghai can be difficult, especially during rush hour or on some secluded street in the middle of the night. You've probably used Uber or at least heard of it, but Uber doesn't serve every area, and often they have surcharges that more than double the rate during peak hours. And it isn't legally recognized here, or in many countries. This is where Chinese apps Didi Chuxing (滴滴出行) and Kuadi Dache (快的打车) come in. Recently, the private car service (zhuanche) of these two apps received legal status (licenses) in Shanghai. They each also run a taxi app service that calls a taxi to your location at a moments notice with a click of a few buttons on your phone. Didi Chuxing and Kuaidi Dache don't have English app versions just yet (Updated 2017: Now they do! ), but the taxi services of their apps are extremely useful and not too difficult to figure out. 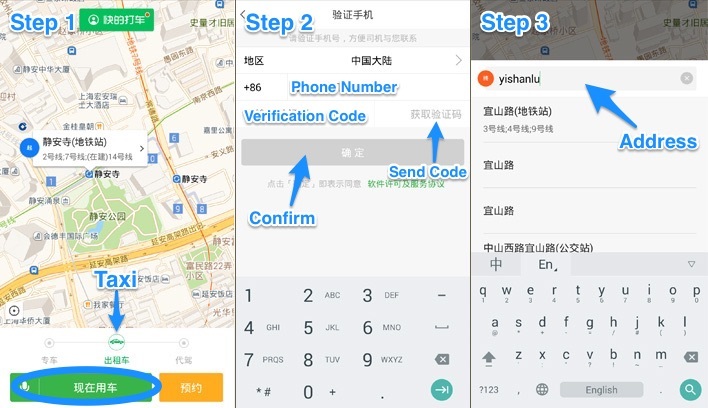 This guide will walk you through the process of hailing a cab with these two Chinese apps, step by step. First, a note about payment methods. 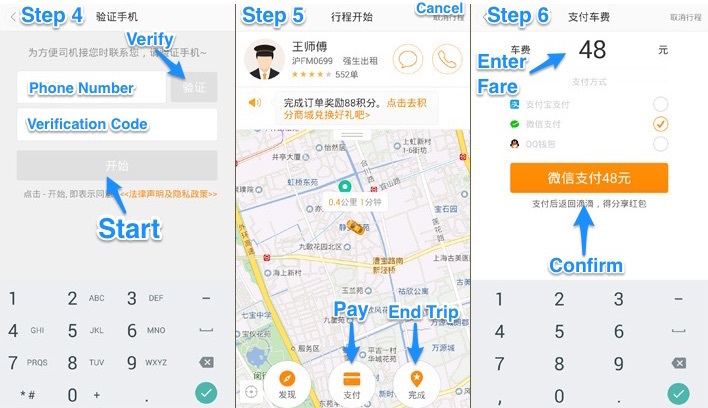 Both Didi and Kuadi allows you to pay with cash (for taxis) or by paying through your phone by setting up WeChat Wallet or Alipay, which you will need if you use their private car service. 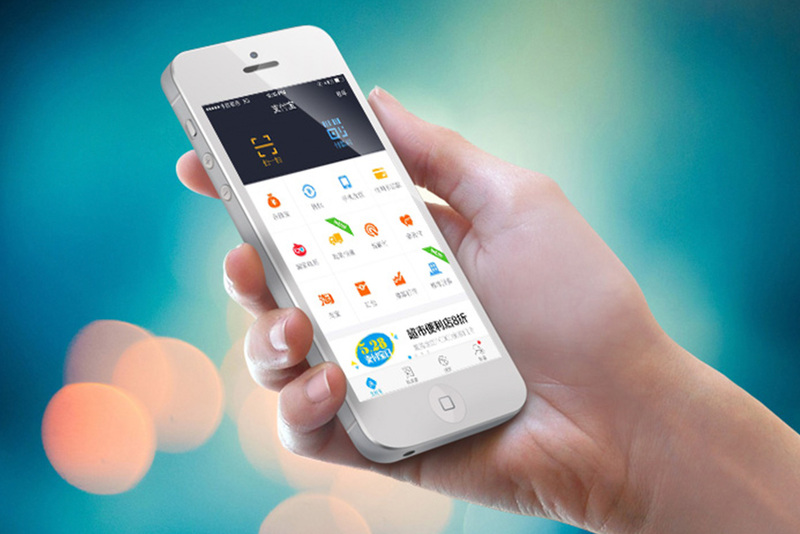 Head over to our article on how to use Alipay, if you haven't set that up yet. WeChat Wallet is a breeze to set up, especially compared to Alipay (we have a guide for that too). You just need to have a Chinese bank card that's registered to your phone number. Note: this step is optional, and you can pay in cash if you're calling a regular cab. 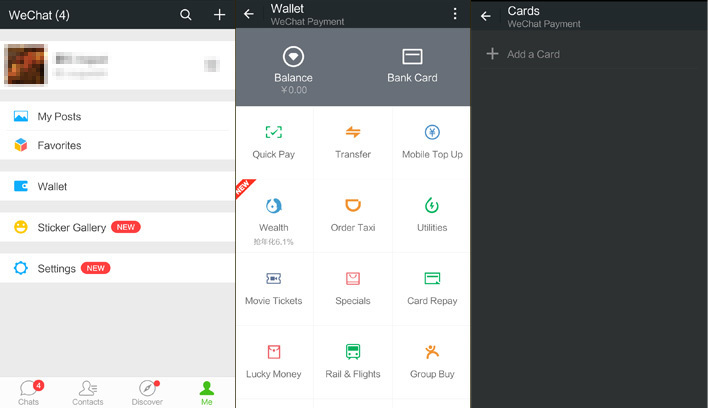 Find "Wallet" in the "Me" tab of WeChat. Then, Click on "Bank Card" and Select "Add a Card". You'll be prompted to type in your debit card. Hit submit. The next screen asks for your name, ID type, ID number, and phone number. The name needs to be exactly the same as the one registered to your bank account. It is case sensitive, so if it doesn't work the first time, try rewriting your name in all capitals. If that still doesn't work, there's a good chance your bank entered your name wrong when you first got the account, and you'll likely have to pay them a visit. Make sure you select "Passport" in the ID type section if you are a foreigner, and enter your passport number into the "ID No." field. Finally, put in the phone number that is registered to your bank account. This number needs to be your current cell phone number because your bank will send you a confirmation code which you will have to enter in the next screen. Once that's done, you'll get a final prompt box asking you to select an six-digit pin number for your WeChat Wallet account. For security reasons, they ask that you pick one different from your bank pin. Type that in twice, hit submit, and your account will be linked. Now you can pay for Didi Chuxing and Kuaidi Dache without ever having to bother with finding change or accidentally dropping your transportation card into the abyss beneath taxi seats. You can do a lot more with WeChat wallet, like pay at convenience stores or transfer money to friends, but that's all pretty self-explanatory and we won't get into that here. Didi and Kuaidi announced in February that they were merging, but there are still two apps on the market. Didi is the more popular of the two. Their app for Android and iPhone can be downloaded from the Didi Chuxing website. 1. There are several options in the upper navigation bar, but you'll want to select "出租车" (taxis). The options from right to left are: Ride Sharing, Taxis, Private Cars, Rent A Driver, and a Chinese car ad. We won't cover the other options in this article, and you probably won't use them if your Chinese isn't up to par. To start your ride, you'll need to click on the orange words on the bottom of the page. 2. Type in your destination address. You can use English here, but you'll only be able to type one street name. If you are trying to write two streets for a crossroad (which you should always do), you'll need to use Chinese. But you can probably write one road in English, then when the taxi comes, hand them your destination address if you have it written. 3. Hit the orange button and your taxi will be called. The taxi driver will call you to ask for your location, and you'll want to tell them the intersection or building name. The taxi will usually arrive with a red light (instead of a green one) on its roof. Pay attention to his license plate number, which will appear on the screen. 4. If this is your first time using Didi, you'll be prompted to enter and verify your phone number. Select the button in the upper right corner and they will send you a text message with your verification pin. Type that in and hit the start button labeled "开始" (now colored) on the bottom. [Optional] The Didi app will search for nearby cars; this can take anywhere from a few seconds to a few minutes. If it starts to take a long time (more than a minute and a half or so), the app will ask you if you want to tip the driver an extra 10 or 15rmb to incentivize nearby taxis to pick up your request. You can choose not to tip the driver and keep waiting, but during rush hour, this might be the only way if you don't want to use the zhuanche function. 5. Once a taxi has picked up your request, they will show up on a map view with the driver's distance and expected arrival time. If you'd like to cancel your ride, click the gray characters "取消行程" on the top right corner. Oddly, Didi doesn't seem to have an option to select that you have entered the cab after it has arrived. It's unclear if this is a bug or just how the app works. Nevertheless, you can choose to pay or end the cab ride at any time. The taxi driver will start the meter as they normally would if they picked you up without the app. 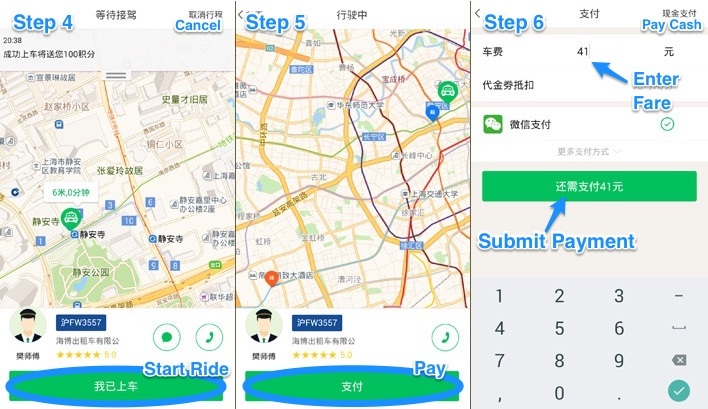 When you have arrived at your destination you can select "支付" to pay your taxi electronically, such as using WeChat Wallet, or you can click "完成" to end the ride and pay the taxi with cash or a transportation card (remember to include the tip if you selected it). 6. If you select "支付", you will be asked to manually enter in the fare on the meter and to select the payment method. Hit the orange button to switch to make the payment through WeChat Wallet. If you use WeChat Wallet, you'll be brought to a new screen asking you to confirm your payment. Hit the green button and enter in your six-digit WeChat Wallet pin. Once the payment goes through, you'll receive a confirmation page. The taxi driver will get a phone notification of a successful payment on his side, and he'll print the trip receipt. Tap "Done" to return to Didi Chuxing and you may choose to give your driver a star rating. Kuaidi Dache is less popular than Didi, but taxi drivers often have both apps, and the user interface is more straightforward and a bit easier to use. You can download their app for Android and iPhone on Kuadi Dache's website. 1. Kuaidi will show your location and let you choose from three services: Private Car, Taxi, and Rent A Driver. Select the middle option "出租车" for Taxi and hit the green button. 2. Like Didi, first time users will also need to input your phone number. 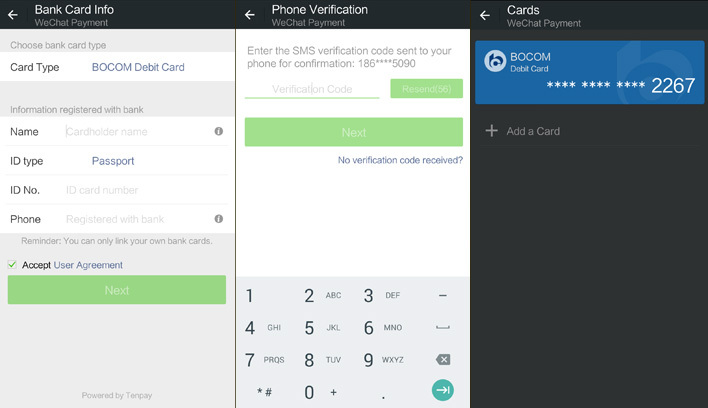 The text on the right just below the phone number input space will turn green once you type in your phone number -- tap it and you'll receive a verification code by text message. Enter that in and hit the confirmation "确定" button on the bottom. 3. 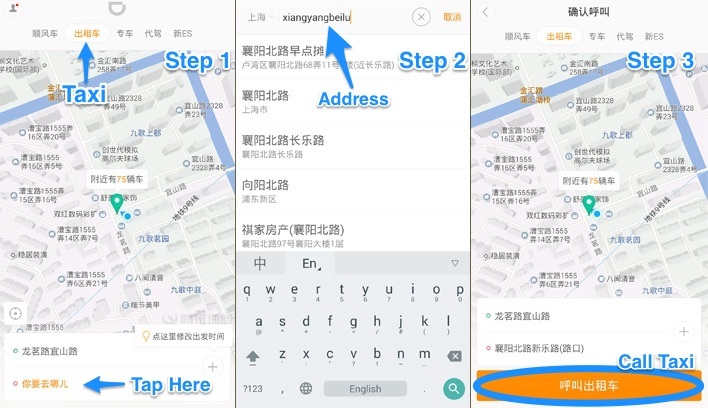 Again, same as Didi, a destination address is required before a taxi can be called, and you will have better results if you can type it in Chinese. But for subway stops or big landmarks, you can get away with using English. After selecting the address. Hit the large green button to call a cab. Kuaidi will find a taxi for you promptly. Coordinate your location with the driver over the phone and he or she should arrive shortly. 4. The distance and time until arrival will be displayed in the map above the small taxi icon. The blue box is the driver's license plate. Once you've gotten in the taxi, select the green button "我已上车" to signal that the ride has begun. The screen will transition to a map displaying your destination location. 5. When you arrive at your destination, hit the green button now labeled "支付" to pay for the ride. 6. You will need to manually input the cost of the ride based on the meter in the taxi and select your payment method. You can also select the gray characters"现金支付" in the upper right corner if you wish to pay with cash or a transportation card. 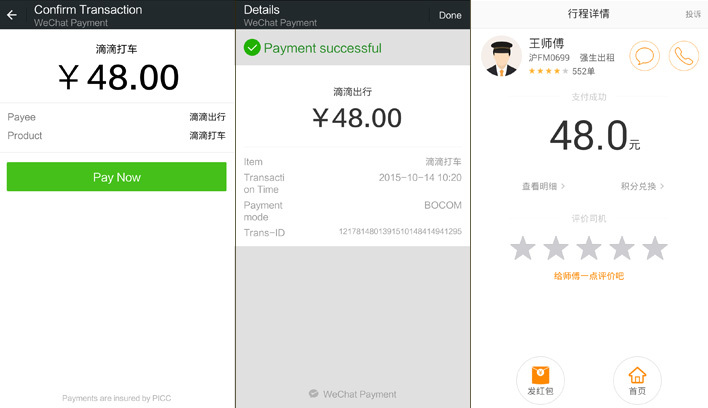 WeChat Wallet's payment screen will pop up asking you to "Pay Now". Tap that and enter your six-digit WeChat Wallet pin number to complete the transaction. 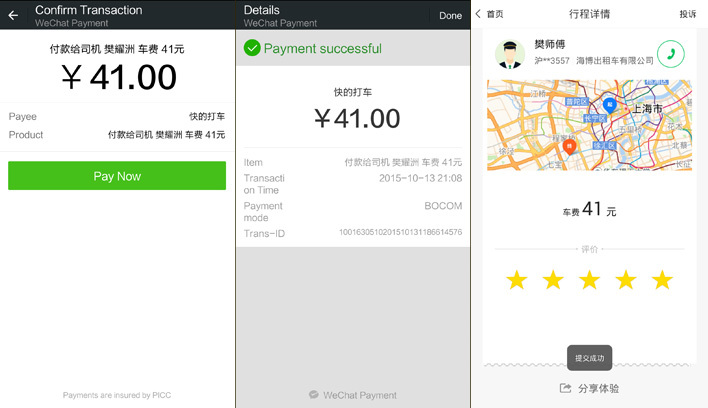 The driver's Kuadi app will send a notification that payment has been received, and you'll be able to ask for the receipt. Tap done to return to the Kuadi Dache and rate your driver. And that's it. We recommend that you play around with Didi Chuxing and Kuadi Dache, and test it out a bit. The apps are definitely worth learning to use, especially if you often find yourself stranded, standing in the middle of the street, looking into the distance for that small green light. You don't even need to download the Didi Kuai Xing app - it's integrated into WeChat. Go to Wallet -> Scroll down and you'll see "Powered by third party operator" and a button for "Order Taxi" and then it's already Didi Kuaixing. 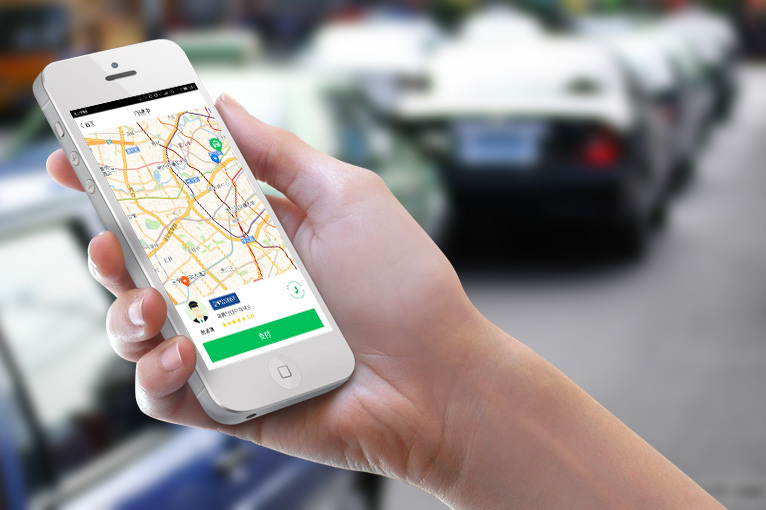 Can you use Didi to book a taxi for a specific time the next day? Thanks.